The title to this section is an entire misnomer, implying as it does events too long ago for written documentation. 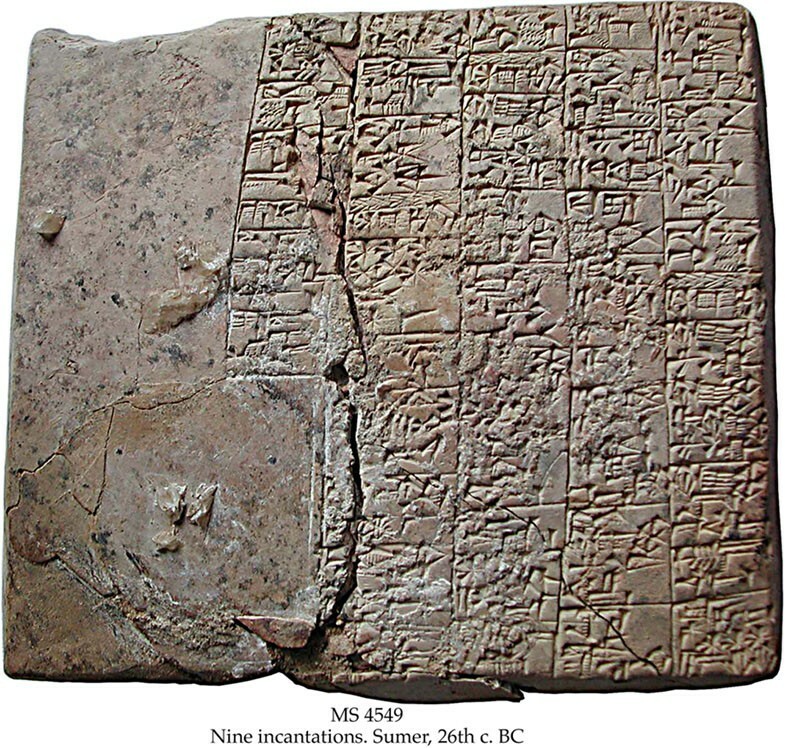 This is silly, because writing predates fountain pens by some thousands of years. Indeed, writing predates pens as such, so far as we know. The earliest writing systems relied on poking clay with a purpose-shaped stick, or gouging at other firm surfaces with a rock or metal instrument. Pens, if we extend the meaning to allow anything that puts marks on a flexible writing surface using capillary action that isn’t a brush, have been around since at least the 4th century BC (or BCE if you insist upon the extra letter) when a reed pen was in use in Egypt to write on papyrus. The quill, based upon a feather, is likely an adaptation of locally-available materials in a place less given to reeds than Egypt, although it may have arisen independently. Quills were certainly in use in the Roman Empire, and remained the standard writing instrument in Europe until the 1800s (if you’re intent on making one, there’s some fine instructions here, but be aware that the brass reservoir they suggest is a modern development). The very word pen comes from the Latin word for feather– penna. The quill has a couple of advantages as a writing implement, in that domestic geese and thus their feathers were reasonably available, and the material is relatively easy to shape to the purpose– we still speak today of a pen-knife thanks to that ubitquitous need. However, these advantages are balanced by a couple of other aspects of the material. The quill would slowly dissolve under the effects of the acidic ink used and wear away on the writing surface (faster on paper than animal-skin surfaces), requiring constant re-shaping and replacement. One was also tied to a bottle of ink, as even a very willing quill doesn’t hold ink for more than a few words at a time. The former problem was addressed by the advent of metal pens. These appeared in the 18th century, with mass production beginning in the early 19th. At this point, “pen” meant only the business end of the implement, what we might today call the point or the nib, with a pen holder to place it into (Wikipedia has a quite informative article without obvious flaws on the topic). The pen holder might be a mere dowel with a receiving ferrule in the end, an ornate confection of gold and shell panels, or even a telescoping item capable of being carried in a jacket pocket. This latter brings us to the lack in the pen which is specific to fountain pens– easy portability. Even medieval scribes sought ways of taking their work on the road, with quill cases and ink-horns that could be suspended from the belt along with the common pouch and dagger. Some bright fellows even toyed with the idea of keeping ink in his quill, with a clever arrangement of a second feather-shaft nested within the pen-cut quill proper to act as an internal reservoir. There were various “reservoir pens” drifting around in 1700s, the most famous of which was a design by Nicholas Bion, an instrument maker in France. His pen was a tube in which ink was put, one end closed with a stopper and the other mostly occluded by a piece of cut quill and a sort of a conical wedge. The writing end was also covered with a cap when not in use, so in many respects the modern fountain pen was almost in existence by 1702– a portable writing instrument predicated on a somewhat-controlled leak of ink. The early 19th century saw more steps in the direction of the fountain pen as it is known today, and with some strangely familiar names involved. Some of the variations get very close to the full modern concept, but the question of getting ink out and air in without sudden eruptions remained elusive; most erred on the side of vacuum, with some mechanism to force ink out when the writing went dry. Not only the components of pens but also what went into them was refined– some early efforts at feeds failed because the chunkier inks available at the start of the century blocked up the channels, but by the 1860s the particulate content was sufficiently fine to allow things like the stylographic pen to develop. Had writing styles been more like today’s, the stylograph probably would have gotten the “Good Enough” stamp of approval from the writing public, but since most smart-looking hands relied on some flex in the pen’s point a workable fountain pen was still pursued. The great change is thus seen to date from Lewis Edson Waterman’s invention of a feed which actually regulated the exchange of air and ink as each moved respectively into and out of the pen’s reservoir. This momentous event occurred in 1883, and we may conveniently start the clock on the eon of fountain pens in that year, the dawning of the Age of Rubber. 1702 – Earliest surviving example of Bion’s “quill without end”. 1790 – Josef Hardtmuth sets up the pencil-making company which will one day be known as Koh-i-noor. 1819 – Scheffer’s Penographic instrument is patented; uses a flexible reservoir and a button to squeeze ink out. No relation to Sheaffer. 1832 – John Jacob Parker patents a self-filling pen; a piston mechanism also serves to force ink out as required. No evident relation to the Janesville Parkers. 1828 – Perry & Co. begins producing pen-points (the start of a trail leading eventually to Osmiroid). 1838 – First price list for Carl Hornemann’s Ink and Paint company. 1846 – Richard Cross sets up to make silver casings for pencils. 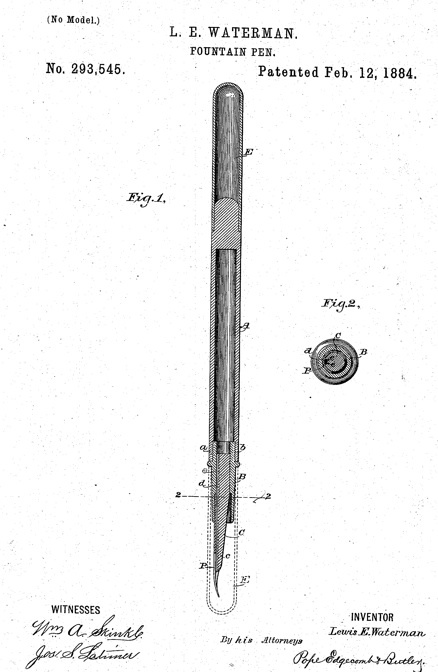 1855 – What appears to be the first patent for pen specifying a hard rubber body is taken out by Newell Prince. 1858 – Richard Esterbrook sets up the first successful steel pen factory in North America. 1871 – Hornemann sells his company to Günther Wagner. 1875 – Duncan MacKinnon patents the stylographic pen in Canada and the United Kingdom (and in the US in the following year). 1878 – Wagner renames his company “Pelikan“. 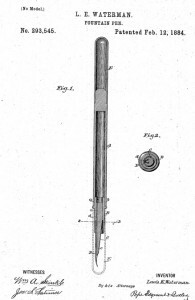 1879 – Cross begins production of stylographic pens, under their own patent. 1883 – Lewis Waterman establishes a pen company.